So, I’ve been thinking a lot about the dubia again, not least following Stephen Walford’s most recent article — which I’ve liked a lot, and I thought I’d get some thoughts down. I might be wildly wrong here, of course. Are the cardinals really saying that the doubts are the cause of disorientation and confusion? Because that makes sense to me. Mueller, for instance, has denied that Amoris Laetitia itself causing confusion, and said that insofar as there is confusion around the exhortation, it was confused interpreters who were producing confused interpretations. In that same interview, Mueller also advised that those talking too much about Amoris, including those bishops who he says were interpreting the Pope’s teaching in their own fashion and those who were taking individual tiny passages from the exhortation and looking at them out of context, to start by looking at what the Church itself teaches about the papacy and the episcopacy. ‘It is asked whether, following the affirmations of Amoris Laetitia (300-305), it has now become possible to grant absolution in the sacrament of penance and thus to admit to holy Communion a person who, while bound by a valid marital bond, lives together with a different person more uxorio without fulfilling the conditions provided for by Familiaris Consortio, 84, and subsequently reaffirmed by Reconciliatio et Paenitentia, 34, and Sacramentum Caritatis, 29. I’m deeply uneasy with how this question has been phrased and framed, as in ways it looks like two questions rather than one, and it seems to contain a numerical shift that’s hugely important when it comes to addressing it. If this is one question, and I’m not sure it is, the question must be the second part, in which case I think the first bit should be treated as a kind of explanatory note, intended to set up a question where we think of an individual in what might be deemed a hard case – a woman or man has remarried and can’t realistically promise abstention from the marital bed without alienating their spouse in such a way that could lead to violence or to children suffering. On this basis, if we had to answer this ‘yes’ or ‘no’ as per the conventions of dubia, such that we can’t qualify it by emphasising ‘in some cases’ I think the answer would then have to be ‘yes’. The thing is, I’d be very uneasy with this kind of answer, not least because the question contains a numerical shift. The introductory statement pertains to individuals, and is explicitly singular in nature, whereas the question is a plural question, and pertains to couples, inviting the question of why a couple who both wanted to come fully into the Church couldn’t jointly strive to live as brother and sister? Saving the kind of precise exception spelled out in my Aquinas, Trent, and Amoris piece in The Irish Catholic, I’m not really sure that couples where either party is divorced-and-remarried could as couples be granted absolution and receive Communion without doing this. And, as such, I think the answer would have to be ‘no’. In general, I think a lot of confusion around Amoris surrounds people who persist in reading as plural terms that are meant as singular. In this case the issue seems actively blurred. I don’t blame Francis for not answering this one. My answer, if I were him, might well have been ‘define your terms’. Then there’s the second dubium. I don’t think St John Paul said at that point in Veritatis Splendor that certain absolute moral norms prohibit intrinsically evil acts without exceptions. Rather, as far as I can see, he said it was wrong to claim that the immorality of acts can only be considered in connection with intentions and foreseeable consequences, with the key thing being whether acts are capable of being ordered towards the good and indeed towards God himself. And I don’t think that’s at odds with Francis’ point at all. In fact, and maybe I’m missing something massive, I don’t see how it could be. So I can see that this would have put Francis in an awkward spot. I genuinely can’t even see where this question comes from. They seem to be asking whether Amoris gives a blanket excuse such that it would be impossible to say that habitual behaviour is ever a mortal sin. The Church already teaches that habit can be a mitigating factor – essentially one’s will is less one’s own that it should be – but not that it’s a blanket excuse for all people in all situations, and I don’t see that Amoris even touches that for a second. Nor, for what it’s worth, do I think the Maltese bishops or the bishops of Buenos Aires or anyone else has ever suggested that. The Church, of course, has long distinguished between such things as the morality of acts and the extent to which this morality can and should be imputed to the actor: if it did not, the Church would only have one criterion for considering whether a sin is mortal, that being ‘grave matter’; ‘full knowledge’ and ‘deliberate consent’ wouldn’t even be part of the discussion. Finally, there’s the fifth dubium. I think this is probably a rather better question than the previous ones, but again it’s marred by the snarkily gratuitous reference to Scripture and Tradition and ultimately leaves me wondering why this would confuse people. Veritatis Splendor talks of how conscience can’t be applied creatively so as to engineer exceptions to the moral law, allowing people to do things that are intrinsically evil. 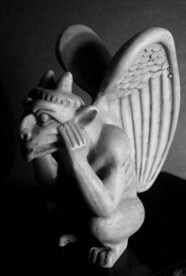 Are intrinsically evil acts also objectively evil acts? I’d have thought they are. I wouldn’t have thought intrinsically evil acts could be anything other than objectively evil ones. Yes? Bearing this in mind, what Amoris Laetitia says is the following. Some situations are – objectively – not what the Church or indeed God wants of us, and our consciences can enable us to realise this. However, it says, our conscience is capable of doing more than identifying whether a certain state is good or bad: it can also identify whether a certain direction is good or bad. That is, it can do more than name a destination; it can show us the way, recognising that this way is God’s way towards the destination that God wishes us to reach. I don’t see that this is wildly different from, for instance, Pope Benedict’s comment about how a prostitute starting to use condoms could ‘be a first step in the direction of a moralisation, a first assumption of responsibility, on the way toward recovering an awareness that not everything is allowed and that one cannot do whatever one wants’. In other words, I think, while we’re not talking about choosing lesser evils, we are saying that within objectively sinful scenarios God can lead people by stages towards a way out, and sometimes can write straight with crooked lines. I’m really not surprised that Cardinal Mueller said he thought confused interpreters were provoking confused interpretations and how the dubia cardinals have said their doubts are causing confusion. Given how dodgy these dubia are, these seem fair observations. Originally published at Mark Shea's blog. It increasingly seems to me that there are few more poisonous elements in the modern Catholic Church than the nest of vipers that is churchmilitant.com – there are reasons, after all, while Philadelphia’s Archbishop Charles Chaput has said it and another site are ‘destructive’, tending to ‘sow division wherever they tread’. Indeed, Archbishop Chaput’s diocesan office is said the site is ‘not interested in presenting information in any useful way’, its ‘sole desire’ being ‘to create division, confusion, and conflict within the Church’. The bulletin, in other words, describes how delegates at the synod said they believed the Church should help people to see if they are called to return to Communion. Granted, you might think this imprudent for various reasons, but even so, if you're honest you'll admit that the reality is not quite the same as the headline description. And yet, if you didn't bother to click through, you might think that initial claim was a fair. It’s funny how people get things so wrong when it comes to San Diego’s current bishop. Only the other week, Ross Douthat was talking in the New York Times about what he calls ‘the teaching document recently produced by San Diego’s bishop, the Francis-appointed, beloved-of-progressives Robert McElroy, following a diocesan synod convened to discuss the implementation of Amoris’. He then proceeds to quote from – as he had linked to – Embracing the Joy of Love, a document Dr McElroy issued in May of this year, just a month after Amoris Laetitia had come out, as he makes clear in the opening line, and most certainly not after the diocesan synod that took place at the end of October. There’d be a lot less craziness in online Catholicism if people only took the time to read things properly. Brexit aftermath: an advisory referendum? There seems to be some debate over whether or not the Brexit referendum was always intended to be advisory rather than binding. Yesterday, for instance, a friend told me on Twitter, "And that 'advisory' caveat has only emerged since folk have wanted to reverse/ignore [the poll result] -- we heard no talk of it before the referendum, or when Remain were strong favourites." He's not been alone in taking this line, but I think this may be a case of "what you hear depends on who's doing the hearing", because I'd certainly heard and understood that the Brexit referendum, unlike, for example, the AV one, was purely advisory, such that regardless of the result it would be for Parliament, which in British democracy is sovereign, to decide whether or not the UK would leave the EU; individual MPs could and should take the referendum result into account in deciding how to vote, but they would not be bound by what was going to be, in effect, a glorified opinion poll. Here is The Guardian, for instance, reporting in February that "Legally the referendum is advisory but in practice it is binding, and may even prompt the resignation of the prime minister." There's a distinction here between legal and political realities, of course, and the latter need serious pondering, but there's a clear statement that as a matter of law the referendum was to be an advisory one. Business Insider, more than a week ahead of the referendum wrote that "Parliament doesn't actually have to bring Britain out of the EU if the public votes for it. That is because the result of the June 23 referendum on Britain's EU membership is not legally binding. Instead, it is merely advisory, and, in theory, could be totally ignored by the UK government." And around the same time, David Allen Green was writing for the Financial Times that, "The relevant legislation did not provide for the referendum result to have any formal trigger effect. The referendum is advisory rather than mandatory. The 2011 referendum on electoral reform did have an obligation on the government to legislate in the event of a 'yes' vote (the vote was 'no' so this did not matter). But no such provision was included in the EU referendum legislation. What happens next in the event of a vote to leave is therefore a matter of politics not law. It will come down to what is politically expedient and practicable." Also in advance of the Referendum, the Telegraph reported that, "A spokesman for the electoral commission said that as the result was an advisory election, rather than a binary one, it was a matter for the Commons. That piece also quoted Nigel Farage as recognising that a 52-48 outcome would be anything but decisive, saying, "In a 52-48 referendum this would be unfinished business by a long way. If the Remain campaign win two-thirds to one-third that ends it." Ahead of the Referendum, The Week wrote that, "In the extremely unlike result of a mathematical tie, it seems likely that Parliament would decide the matter – not least because the referendum is not, in fact, legally binding." Strikingly, on the day of the Referendum, the Israeli daily Haaretz asked "Is the referendum binding?
" and answered "No. Parliament isn't legally required to abide by the vote, but there would be strong political pressure to do so, especially if the result of the referendum is clear-cut." I'm not saying that the fact of the referendum being a non-binding advisory poll was sung from the rooftops in the run-in to the vote. I am, however, pointing out that this fact wasn't invented -- even in the old sense of 'discovered' -- in the aftermath of the vote or even when things were looking bad for the cause of remaining in the Union. Let's face it, if the Israelis knew well before the votes were in that the referendum was not something that parliament would be obliged to implement, but only something to be engaged with and take into account rather than be obliged to implement, any English voters who didn't to grasp this only have themselves to blame. What happens next is a matter of politics, not law. The fact that an English majority a few weeks back said they wanted to leave the EU is an important political reality. It's not the only one. After Brexit, what now for the North? I was troubled last night to read people expressing delight at the huge queues at polling booths across the UK. Such a massive turnout, seemingly, was a triumph for democracy. I wasn't so sure. There's far more to democracy than just casting votes, and those who act as though democracy is something that happens but on rare occasions and purely in the privacy of the polling booth do a disservice to democracy. If democracy is to mean anything -- if our votes are to mean anything -- we have to participate in an informed way. I was pretty sure that wasn't happening: how valuable are votes cast on the basis of a mythical £350m a week, or to ward off Turkish accession, or in the belief that EU laws are made by unelected bureaucrats, or that there's no way to remove the European Commission from office, or because of the belief that British fishing collapsed when it joined the EEC, or any of a host of other lies? The 'Leave' campaigners lied and lied egregiously throughout the Brexit referendum campaign, and did so tapping into decades of popular poison from the British press, and if lots of people who've long felt disenfranchised and ignored should have been willing to go along with this kind of stuff, well, maybe that should have been expected. I've less sympathy for others, for those who take the pains to be informed of things they care about, but who on other issues prefer instead to listen simply to those whose political views conveniently tally with their own judgments and to shout down calls for them to inform themselves as mere elitism. So for those who make much of their pro-life credentials, and who dismissed my concerns and those of others about the lives and livelihoods of those in Northern Ireland being actively endangered by a vote to quit the EU, here are just a handful of things they might look before they next put themselves forward to speak as Catholics or pro-lifers, or even just look in the mirror. Not for nothing has The Irish Times said, "Of all the things that could happen to an Irish government short of the outbreak of war, this is pretty much up there with the worst of them." Then there was The Guardian a couple of days back, observing that, "Great Britain may be able to weather a Brexit, but Northern Ireland simply cannot." Lucinda Creighton may not be everyone's cup of tea, but she had a point when she said the other day that, "Brexit poses the greatest threat to the Northern Irish Peace Process since the Good Friday Agreement was signed in 1998." For a more cautious take, unsurprisingly from a pro-Brexit paper, The Telegraph warned, "The scenario of the UK leaving the European Union, when a majority of the population of Northern Ireland have opted to remain (and especially if there has been a decisive vote in favour among the nationalist community), may exacerbate tensions, fuel demands for a border poll on Irish unification and challenge the durability of the peace process." Then we have from the Centre on Constitutional Change the observation that "a British exit from the EU risks undermining the very self-determination and national sovereignty that its adherents believe it will bring about", continuing, "This is because it risks shattering the fragile balance and stability of the UK by threatening the peace settlement in Northern Ireland ". Onetime MEP Brendan Donnelly wrote from the London School of Economics, meanwhile, that "it is clear that much potential exists for the destabilisation of Northern Ireland through a vote to leave the EU on 23 June", continuing, "The Good Friday agreement is under more strain from a currently low level of sectarian violence than is sometimes appreciated". At the Euractiv site, Paul Brannan hammers this home when he says, "with politics in Northern Ireland already on the brink of breakdown and the Good Friday Agreement in jeopardy, a UK EU exit threatens a total collapse of the peace process". And for those who think Britain can keep the show on the road, as though it's taken seriously as an honest broker and was never known as 'perfidious Albion', The New Statesman points out: "Funnily enough, the same people who don't trust Britain to administer the peace process would also be unhappy with the EU leaving that process." I could say more, but that'll do for now. Words seem unlikely to do any good now the die is cast. About a week or so back Catholic Voices hosted a debate in London in which two speakers gave impressive speeches on why the UK should remain in the European Union and two argued in similarly impressive fashion to the effect that the UK should leave the Union. Better-humoured, more honest, more thoughtful and broader-minded than almost all engagements I've read or witnessed on the topic, the debate on the motion "This house believes that Catholic values are best served by remaining in the European Union" was nonetheless striking for a complete absence of references to the single most Catholic part of the UK, that being Northern Ireland. According to 2011 figures, 40.8% of the Northern Irish population is Catholic. This stands in stark contrast to England and Wales, for instance, where, if Steven Bullivant is right, just 13.7% of the population say they were raised Catholic, with a mere 8.3% of the population holding to the Faith now. I appreciate the Brexit debate is really an 'Exit' debate in that the discussion is primarily driven by English concerns and will be decided by English votes, with the lesser partners in the UK at best hoping to tip the scales if an English vote is finely balanced, but I think that English voters should at least give some thought to how their votes are likely to affect things beyond England. Northern Ireland's bishops have, of course, warned of the dangers of a Brexit to the North, and their concerns seem shared by Northern Ireland's Catholics. A Millward Brown poll in early June found that 70% of Northern Catholics were in favour of the UK remaining in the EU, with a mere 12% advocating that the UK quit the Union. A more recent Ipsos Mori poll has shown just 56% of Catholics in favour of remaining in the Union, though again a mere 12% seem to back a Brexit. Such low support for withdrawal from the Union is understandable in a region where the UK's only land border is to be found, and where there has never really been a traditional border: for centuries, after all, Ireland was united under one form or other of British rule, and even after the Irish War of Independence it was possible for people to cross back and forth without a passport. Under the UK's 1949 Ireland Act Irish people are not considered aliens in British law, and the soft and porous nature of the border has been vital for the North's economy. It's not really surprising that people in the border counties especially might not be looking forward to this ending. Of course, it's far from obvious that a hard border will be imposed between Ireland and the UK within the island of Ireland. Given the realities of Irish roads, about 200 of which cross the border, and how farms and fields straddle the boundary, it's hard to see how any border within Ireland, even one policed by border guards and soldiers, could bar from the UK anyone really intent on crossing over. And given that immigration fears are utterly central to Britain's EU debate, this is a question that needs pondering. Cameron engaged with this in the Commons last week, when he answered a question from the SDLP's Alasdair McDonnell by saying that following Brexit there would have to be a hard border. "Therefore," he said, "you can only have new border controls between the Republic and Northern Ireland or, which I would regret hugely, you would have to have some sort of checks on people as they left Belfast or other parts of Northern Ireland to come to the rest of the United Kingdom." I suspect that in practical terms a functional EU/non-EU border would have to be not in Ireland but between Britain and Northern Ireland, thus splitting the UK and making the Northern Irish second-class citizens, as the alternative would be bringing in checkpoints on dozens of Irish roads with soldiers patrolling the lands and minor roads between them, all of which would be likely to require the kind of security apparatus likely to fire up the republicans again, inviting a return to the kind of protracted low-intensity civil war that previous blighted the North. Even aside from the technical issue of the border, there's a high chance that a Brexit vote would impoverish Northern Ireland. Farm subsidies are regional expenditures, and it's striking that Northern Ireland's farmers receive four times the amount of EU subsidies than do England's ones. 80% of Northern dairy produce is exported, and when pondering this people need to remember that no part of the UK exports a higher proportion of its exports to other parts of the EU than does Northern Ireland. Any kind of border would hurt that, as would any imposition of tariffs and any hindering of the currently free trading arrangements. Tariffs on dairy imports to the EU, it's worth pointing out, average 36%. The EU has played an absolutely crucial role in the Northern Irish peace process, of course, with John Hume detailing in his 1998 Nobel Prize acceptance speech how he had been hugely inspired in his work for peace by his European experience. "I always tell this story," he said, "and I do so because it is so simple yet so profound and so applicable to conflict resolution anywhere in the world. On my first visit to Strasbourg in 1979 as a member of the European Parliament. I went for a walk across the bridge from Strasbourg to Kehl. Strasbourg is in France. Kehl is in Germany. They are very close. I stopped in the middle of the bridge and I meditated. There is Germany. There is France. If I had stood on this bridge 30 years ago after the end of the Second World War when 25 million people lay dead across our continent for the second time in this century and if I had said: 'Don't worry. In 30 years' time we will all be together in a new Europe, our conflicts and wars will be ended and we will be working together in our common interests', I would have been sent to a psychiatrist." "But it has happened," he continued, "and it is now clear that European Union is the best example in the history of the world of conflict resolution and it is the duty of everyone, particularly those who live in areas of conflict to study how it was done and to apply its principles to their own conflict resolution." "All conflict is about difference, whether the difference is race, religion or nationality," he said, continuing, "The European visionaries decided that difference is not a threat, difference is natural. Difference is of the essence of humanity. Difference is an accident of birth and it should therefore never be the source of hatred or conflict. The answer to difference is to respect it. Therein lies a most fundamental principle of peace - respect for diversity." "The peoples of Europe then created institutions which respected their diversity - a Council of Ministers, the European Commission and the European Parliament - but allowed them to work together in their common and substantial economic interest. They spilt their sweat and not their blood and by doing so broke down the barriers of distrust of centuries and the new Europe has evolved and is still evolving, based on agreement and respect for difference," he said, before declaring, "That is precisely what we are now committed to doing in Northern Ireland." Fine words? Sure, but accurate ones too, and not merely has the European project, with its dedication through most of its history to peace-building through calling people of different communities to work together, inspired peace in the North, but it has underpinned it too. As the Ulster Unionist MEP Jim Nicholson wrote the other day, "I will always remember when, in October 1994, just as the loyalist ceasefire was announced, Ian Paisley, John Hume and I met with then European Commission president Jacques Delors. He shared our optimism that Northern Ireland would move to a new beginning away from violence and pledged EU financial support. And he was true to his word -- weeks later, £240m of European funding for peace-building in Northern Ireland was approved. By 2020, Northern Ireland and the border region of the Republic will have received more than €2bn in PEACE funding alone. PEACE funding only makes up one part of the money the North draws down from Europe, Nicholson continued, and the truth is that the EU has largely rebuilt Northern Ireland since the ceasefires began. Northern Irish prosperity, and Northern Irish peace, in no small part depend on the EU. Those who might doubt that a vote for Brexit is a vote to destabilise Northern Ireland should look too at the Good Friday Agreement, which explicitly rests on the fact of the UK and Ireland being "partners in the European Union". The North-South Ministerial Council envisages the Northern and Republican governments working together -- at a local level, for those who doubt that subsidiarity matters to the modern EU -- on a range of such necessarily EU-related matters as agriculture, the environment, tourism, transport, and the management and oversight of EU programmes through Ireland's National Development Plan and Northern Ireland's Structural Funds Plan. It's hard to see how this strand of the agreement can work if Northern Ireland is no longer in the EU, and since the Northern Assembly is explicitly described in the agreement as "mutually interdependent" with the Council, it looks as though withdrawal from the EU could endanger the entire Northern settlement. And that's not even getting into how under the agreement everyone in Northern Ireland is entitled simultaneously to be citizens of the UK and Ireland, such that following a Brexit they could -- on the face of it -- both be citizens of the EU and non-citizens of the EU. I'm not sure how how much thought's been given in the Brexit camp to Schroedinger's Ulstermen. Overall, a Brexit vote is a vote to risk instability, poverty, and civil war in Northern Ireland. It's not really surprising that the Northern bishops and the vast majority of Northern Catholics are opposed to it. It baffles me how many in England seem not to care in the least about this. Imagine if, during the Scottish independence referendum, a few nationalists with a bit of cash had got together to make a ‘Scexit Movie’. Imagine, then, a succession of talking heads babbling about how England having 85% of the UK population means the Scots can only influence the direction of the UK when the English are split down the middle, about how the UK voting system means that two out of five English votes can be enough to control the whole UK, and how a free and independent Scotland would be wealthier than anyone could imagine. And then, having pondered that, imagine a thoughtful-looking Scot on the train from Edinburgh to London, saying he’s on his way to London to find out what the UK is all about, and in London hopping into a black cab at Trafalgar Square, addressing a baffled cabbie with “The UK, please”. That’s pretty much how last month’s Brexit: The Movie starts, and looking at it again now after a few weeks’ recovery since my last viewing, it’s not matured with time. Time and again in recent weeks, friends and nodding acquaintances have been flagging video after video online, calling on people unsure of their referendum voting intentions to watch them as though they’re slamdunk arguments for the UK quitting the EU. I’ve looked at a few and found them unpersuasive, typically loaded with fictions, half-truths and contradictions, dependent on dubious presumptions, and assiduously devoid of inconvenient truths. Don’t get me wrong, I’m not saying I’ve been impressed by the louder voices calling for the UK to stay in the Union; while prominent Brexiteers have traded in outright falsehoods about the past and present, prominent Bremainers have with depressing frequency tended towards apocalyptic predictions based on worst-case exaggerations, their cases not being helped by – all too often – their own back catalogues of anti-European opportunism. Sure, I think reckless prophecies are better than blatant and demonstrable lies, but I think we can all agree that neither's especially good. Given this is my fourth attempt in the last fortnight at trying something on Brexit: The Movie, as life keeps getting in the way, I’ll not be tackling any other high-profile interventions in a head-to-head way this side of the referendum. Instead, if I can, I’ll try to do two or three posts this week on why I think the EU is a good – if imperfect – thing, and why I think leaving it would be an irresponsible thing to do. When I first watched the film I scrawled 18 pages of notes detailing obvious problems in it, and though I’ll not get through them all now, I think it’s worth starting by pointing out how problematic and telling the map that first appears a little over a minute into the film is. See the obvious problem? Yep, there’s the EU carefully marked in blue, and there, floating off its coast in ‘rest of the world’ beige, are Britain and Ireland. It’s almost as though the people who’ve made this film don’t realise that most of Ireland is part of the EU and indeed has been independent of the UK for almost a century. In truth, it’s almost as if the people responsible for this film haven’t a very good grasp of history at all: they seem to have but the most cartoonishly propagandist understanding of British history up to, oh, 1913 or so, and depend utterly on pub rantings for their knowledge of what’s happened since. But on that, more later. As suggested above, the whole “take me to the EU” thing is, of course, as absurd as hopping into a taxi in London and saying “take me to the UK”, partly because you can’t be taken to the EU when you’re already in the EU, and partly because just as there no single building that houses the UK’s governing institutions there’s of course no single building in which the EU’s institutions are found –that's the nature of complex institutions intended to tackle complex things like, well, reality. For Brexit: The Movie, this is a bad thing: the narrator describes this as where “the EU slips its first cog” since “for a democracy to function there needs to be transparency”. Of course, while the EU has democratic elements, it isn’t a democracy, and I don’t know many British people who would want it to be one, given how this would mean abandoning all British vetoes and any decision-making mechanism beyond the parliament in which they’d never be likely to make up more than 12% or so of the vote. • And the Commission is tasked with implementing it. There’s more to it than this, of course, not least as there are different types of laws, but this is the guts of it. The key thing to note is that it is the elected national governments that collectively set the course of the EU, and that make the laws in combination with – in most cases – the elected MEPs of the European Parliament. These are not “faceless bureaucrats” or anything of the sort. They are elected representatives whose own people can remove from office. The Commission, despite constant claims to the contrary, do not make the laws. They may draft things, but unless the European governments decide to turn those things into laws, they’re just bits of paper. It is a blatant untruth that “the real power in the EU, including the power to legislate, lies not with the parliament, but with EU officials”: EU officials do not make laws. If the various talking heads in this polemic don't understand how the EU works, well, maybe this says something about the extent to which they’re qualified to criticise the EU. At this point I'm starting to wonder if it'd be worthwhile paraphrasing Fulton Sheen to the effect that there are not one hundred people in the United Kingdom who hate the European Union, but there are millions who hate what they wrongly believe the European Union to be. An extensively lobbied and utterly irrelevant parliament? Leaving aside how mine, fwiw, are Brian Hayes of Fine Gael, Sinn Féin’s Lynn Boylan, and the independent Nessa Childers, I think the question doesn’t really work in the UK, or at least in England. English people are used to having “their MP”, such that it’s not always easy to get the hang of having, say, eight MEPs, as people in North West England do. Would Claire Fox require people in that constituency to know the names of all eight of their MEPs, or just one? Nigel Farage pops up next, claiming that the European Parliament is the world’s only parliament where elected representatives cannot initiate legislation. The fact that the Parliament can ask the Commission to draft legislation – with these requests increasingly being acceded to, reflecting an informal but real growth in parliamentary influence – doesn’t get a look in. Next up there are more heads claiming that the MEPs are utterly powerless, and that voting for them is pointless, all of which is rather undermined by a sequence later in the film about how large corporations spend a fortune trying to influence them. Would large corporations really try so hard to woo MEPs if they didn’t matter? In truth, MEPs have a wide range of powers, can block most Commission proposals from becoming law, and have the power to censure the Commission, forcing its resignation. Yes, democratically-elected MEPs have the power to depose the Commission. None of this, of course, is mentioned in Brexit: The Movie, which instead concentrates on painting a risibly false picture of the British as subjects of unelected bureaucrats who impose laws in which the British have no say. All of which makes it all the stranger then to see, after a section about how MEPs are given startlingly large amounts of money, MEPs Nigel Farage and Daniel Hannan banging on about how the only reason why local authorities, academics, and people in the arts like the EU is because their support is bought with EU money. Yep, people who get money from the EU can't be trusted to tell the truth about the EU, say two people who are very well paid by the EU. I’ll just let that sink in for a bit. An elderly fisherman then says, “The EU has just obliterated the English fishing industry altogether. The quota system they’ve got now is just mad.” He then gestures beyond a nearby pier to say how a huge Dutch trawler had been there, three or four miles off the coast, entitled to “25% of the whole quota of all of England”. There is still a prospering North Atlantic fishing industry, the film continues, “but only in countries that have retained their independence”. Now, there's no denying that fishing in Britain is not what it was, but what tends to be glossed over is that the main decline in the industry happened before Britain joined the EEC. The numbers employed in fishing dropped by 55% - 26,000 people – between 1948 and 1970, before basically stabilising and staying more or less the same until 1994, when numbers again began to drop after quotas had to be imposed in order to prevent fish stocks from being wiped out. The overall decline since 1994 has been less than half that than the years leading up to the UK joining the Common Market. What's more, it's simply nonsense to talk of how Britain lost control of its fishing grounds when it joined the Common Market; at the time Britain joined the EEC, Britain’s territorial waters extended twelve miles beyond the coast, and this twelve-mile zone is still exclusively British now. If a large Dutch trawler was indeed genuinely operating in this zone, as claimed in Brexit: The Movie, it was breaking the law, and the issue then is one of simple lawbreaking and perhaps an English inability or unwillingness to enforce the law as it stands. Britain’s territorial waters have since the mid-1970s extended 200 miles from the coast, but this extension into waters where the Dutch, Scandinavians and others had long fished happened while Britain was already an EEC country. Far from being powerless to prevent others from being allowed to fish in these waters, the UK agreed to this in negotiations. According to recent statistics, the UK has the second-largest fishing fleet in the EU, and with 30% of the overall fish quota, lands the second-largest catch in the Union. A core part of the video is a “historical” section, purporting to explain how “the British” are different from “the Europeans”. Yes, the inverted commas are deliberate. “The British,” it begins, “freed themselves from suffocating feudal regulations centuries before the Europeans.” Leaving aside how this ludicrously presents feudal class structures as though they were akin to government regulations, the point of this line is to lay down the central thesis of the film: regulation is bad and the absence of regulation is good. There’s not a word about how the costs of unregulated industry were born by the urban poor, of how diseases, malnutrition, child labour and infant mortality were rife in 19th-century Britain, and there’s certainly not a word about how a lack of regulation and a fetishisation of free market economics contributed to the Irish famine that killed more than a million UK citizens and forced at least as many again to leave their homeland. Yep, the single biggest disaster in terms of lives lost the UK ever experienced was in no small part caused by a lack of regulation. Good times. Neither is there even the slightest mention of how all this was utterly dependent on the exploitation of people all over the world, with vast numbers dying in the colonies through famine and massacre. Orwell nailed this reality in 1937’s The Road to Wigan Pier when he observed that “apart from any other consideration, the high standard of life we enjoy in England depends upon our keeping a tight hold on the Empire, particularly the tropical portions of it such as India and Africa”. With nary a mention of how Britain needed that Empire to maintain what comfort the middle classes and those above them had, the film ignorantly or duplicitously goes on to talk about how things were great till the First World War, when regulations started to creep in, being ramped up in the Second World War, and going out of control after that, strangling British ingenuity. The 1950s and 1960s, then, are painted as an over-regulated hell, with no mention of how Britain was struggling with the massive costs of the Second World War and was in the business of losing the Empire. Most of Ireland had broken away from the UK itself after the First World War, massively reducing the national territory, and India broke away within three years of the Second World War ending; colony after colony would follow. Meanwhile, the film claims, West Germany was blossoming through deregulation, which I think a somewhat simplistic take on the Economic Miracle. Along came the Common Market then, holding up a wonderful tariff-free future. Daniel Hannan leaps in to claim that in the 1970s Britain had loads of problems but looked across the channel and thought “these chaps are doing something right”, almost as though the UK hadn’t been desperate to join from 1960 on. “But the architect of the EEC wasn’t German – he was French,” the film continues, presenting Jean Monnet as an obsessive planner, partly responsible for having crippled the post-war British economy, and all set to shackle the EEC. Schuman and the other fathers of the European project don't get a mention in this shamefully selective narrative, of course, but maybe that's the nature of polemics: this isn't about truth, this is about winning. “It soon became clear that the Common Market was so much more than a trade deal,” observes the film, as though this hadn’t been obvious since Robert Schuman’s 1950 Europe speech, explicitly stated in the first sentence of the Treaty of Rome, and praised by a young Margaret Thatcher in the 1960s. “Its membership kept going up, as the EU assumed greater powers,” it goes on, as though increased membership wasn’t a British objective, before returning to the eternal villain that is regulation. Rather than arguing that perhaps some regulations shouldn’t have to be applied to companies that trade only on a local basis, but the creation of a genuine common market requires common standards for companies, products, and services being traded across that market, the film simply goes for the line that regulation is bad. EU regulation pushes up the price of everything, we learn, forcing up the cost of living and making Europeans poorer. Now, I think we all know that since the crash of 2007 things haven’t been as they were, but still, if you look at the overall figures I don’t think there are many economists who’d say the figures show that Europeans have gotten poorer since joining the EEC or EU. Certainly Britain hasn't. The Common Agricultural Policy is another predictable baddie in this screed, but while the policy is by no means unflawed and in some ways has been immoral, there’s no hint in the film of how it exists to ensure that Europe keeps people on the land and can always feed itself if it has to. It’s worth bearing in mind how much food – not far off half its total consumption – Britain has to import, remembering that food security was one of the reasons why Thatcher said on 8 April 1975 that Britain shouldn’t leave the Common Market. Still, if regulation is a villain in this film, it’s nice to see the World Trade Organisation appearing as a hero, even if its first head, Peter Sutherland, was previously an EU commissioner and someone who consistently warns against what he sees as the absurdity and destructiveness of British withdrawal from the EU, noting that the current incumbent of his old WTO seat holds the same views. The WTO is opening up the markets, deregulating and driving down tariffs, the film assures us, claiming that the EU is a thing of the past, a declining trade block, and a macroeconomic corpse. None of these claims about the EU are true, and insofar as the EU has a smaller proportion of global trade than it once did, this mainly reflects how such huge countries as China and India have been playing catch-up, and expanding rapidly in the way that low-cost economies can. Switzerland is held up as a model of what a Britain outside the EU might be like, with ludicrous lines about how despite not being in the EU, Swiss exports per head are five times higher than Britain’s. Predictably, the film doesn’t discuss how Switzerland avoided such major 20th-century body blows as the two world wars and the loss of an empire, and how this might have benefitted the country. One Ruth Lea rightly says comparisons with Switzerland are “totally bizarre”, but the film storms on to show just how wonderful things can be outside the EU. There are others, of course, who would point out that Switzerland offers a genuinely useful case study in why it's not a good idea to thumb one's nose at the rest of Europe. Given how the EU countries responded to Switzerland trying to curtail immigration a couple of years back, is it ever really likely to be the case that the EU will give competitive advantages to a country that turns its back on the whole project? Nigel Lawson shows up thwarting a straw man when he says “the idea that you have to be in the European Union to trade with the European Union is a total absurdity” – so it is, Nigel, which is why nobody’s saying it. Onward then, with the claim that “the EU is desperate to keep its goods flowing into the UK”, with German cars as ever highlighted as the key product; the “Germans’ biggest industry needs us to the tune of 16 billion plus every year,” declares David Davis. Perhaps so, but with Germany’s automobile sector having a turnover of €351 billion in 2011, and a foreign generated revenue of €194 billion, I’m not sure how “desperate” Germany might really be. Besides, we’re told, there’s a big world out there. Anglo-Chinese trade over the last ten years has been growing several times faster than Anglo-EU trade. The fact that less than 3% of the UK’s trade is with China, as distinct from about 45% with the rest of the EU, is conveniently omitted. “They need us more than we need them” declares Ruth Lea, which is a baffling statement given how the proportion of UK exports that go to the rest of the EU is far larger than the proportion of exports from the rest of the EU that go to the UK. Ours? What regulations are these? The fact that the whole film has been holding up the dream of an unregulated Britain seems to have been forgotten. I'd hope that most people who've watched the film would realise that that line made no sense whatsoever. Just like the economic models underpinning the films grand aspirations. Why quibble about 'Europe' while cherishing 'Britain'? I know, I've been quiet lately, but Brexit debates and other matters are causing me to rethink my unremunerated silence. Just after work, and before I pedal home, I want to write something about this annoying Spiked article in which Brendan O'Neill wheels out the Brexiteer whinge that it's oh-so-unfair that the BBC often refers to the EU as 'Europe'. I think the BBC is right to refuse, but before considering why, I think it's worth noting that Brendan plays some tricky language games in this piece. When he bangs on about "the conflation of the Brussels-based oligarchy with the continent of Europe", he conflates the European Union with the European Commission, the latter simply being the Brussels-based civil service that proposes possible actions that only become laws if the national governments (or most of them, at any rate) vote for them. I don't think there are that many people out there who would think it okay to say, as a matter of course, "the UK" or indeed "Britain" when what they really mean is "the Civil Service". If there's dodgy conflation going on here, it's mainly on Brendan's part. I mean, really, what's he on about with lines like "the way Brussels can impose its writ on nation states"? Does he mean "the way the European civil service, staffed by people from all over Europe and headed by people answerable to the European Parliament* and appointed by every single member state's government, can draft possible laws either when asked to do so by the governments or the European Parliament or do so off their own bat, send them to the national parliaments for feedback, and then submit them to the Parliament and the Council where the governments will scrutinise the proposals, haggle over them, and then vote so they become binding decisions which the national parliaments will then vote on so they can harmonise with their own national law codes"? I think the process is a lot more representative and a lot less dictatorial than Brendan suggests. In any case, like I said, I think the BBC is right, for at least three main reasons. First,"Europe" has long been a colloquial term for the European project, whether speaking of the EEC, the EC, or the EU, such that it seems like a deliberate attempt to rig the game further by trying to change this now. There are no shortage of Brexiteers who've opposed the project since before the establishment of the EU, after all, whether at the time the UK signed up to the Treaty of Rome on the basis that the UK, with other countries and among other things, was "determined to establish the foundations of an ever closer union among the European peoples" and had "decided to ensure the economic and social progress of their countries by common action in eliminating the barriers which divide Europe", during the 1970s referendum of withdrawal from the Treaty of Rome, or at the time of the Single European Act in 1980s. Second, proponents of UK withdrawal from the Union typically don't just want to withdraw from the EU. The European Court of Human Rights is constantly invoked as a shackle on British sovereignty, with the conflation of the Court with the EU being rationalised by the claim that you can't be in the EU without being subject to the court as a signatory of the European Convention on Human Rights. Quite so, but neither can you be in the 47-country Council of Europe -- the flag of which the Union shares -- without accepting the Convention and the authority of the Court. Third, it's a bit rich that people who insist that 'Europe' should never be used as a synonym for "European Union" are all too often quite comfortable saying "Britain" as though it's somehow synonymous with 'United Kingdom of Great Britain and Northern Ireland', not least when they say "Brexit" when they mean "Ukexit". I'm not saying this is brazenly hypocritical, well, not necessarily, just that it seems at best indicative of muddy thinking, unless it's a recognition that Brexit might well precipitate the disintegration of the UK, as William Hague, the Scots nationalists, most Northern Irish parties, and others have all acknowledged. It's probably worth adding that the oft-repeated line about how "Britain isn’t leaving the continent of Europe" is historically dodgy, leaving aside the Britain/UK issue. Europe is a cultural continent rather than a physical one, after all; really just Asia's western peninsula, its borders are a matter of changing convention rather than anything else. Norman Davies talks in Europe: A History of Europe being a tidal continent, such that it's eminently possible to imagine Britain leaving it. Certainly, I know people who would insist that Britain is not and never has been part of Europe, and while I think they're wrong, they testify to a possible reality. As an example of this sort of thing, it's worth noting how Cambridge's David Abulafia, one of the 'Historians for Britain' crowd, talks of "a historical perspective on Britain’s relationship with Europe" and "a long history of British engagement with Europe" -- noting that Europe is a place with which Britain can have links, rather than a place where Britain is to be found.He talks of Britain "becoming European", which seems a claim that Britain has not been European in the past, perhaps because, he says, "the United Kingdom has always been a partner of Europe without being a full participant in it". Granted, you might think that someone who says of national boundaries that "even Britain has contracted, with the departure of most of Ireland" hasn't really got a handle on what or where exactly Britain is, and might be better off not talking about this issue at all, but that's a debate for another day. * Yes, it is called that. The European Parliament. Not the EU Parliament. Do the Brexiteers think the BBC should start calling the European Parliament by a name they've made up? Presumably they likewise think the European Commission should be renamed the EU Commission, and the European Court of Justice be called the EU Court of Justice. And then, maybe, they'll suggest the BBC become the UKBC. It's been very strange watching some Irish responses online to the week's horrific events in Paris. Following the murders at the offices of Charlie Hebdo, and subsequent hostage-taking and killings elsewhere, far too many people have seen this as a suitable time to demand that Ireland's 'blasphemy laws' should be repealed, and to scorn as hypocritical the Irish Times' criticism of the murderers' attempts to silence debate, given how our self-proclaimed 'paper of reference' once removed a cartoon from its archives. Now, you might just think this kind of behaviour is just cynical opportunism, or is typical of that clueless parochial narcissism that so often blights our national discourse, and you might well be right, but it's worth looking at both issues separately for a moment. Writing about this on his blog, where after some reflection he changed his headline from one identical to the tweet to one saying, 'Irish Times Leads Nation’s Protest Over "Charlie" But Forgets About Cartoon It Censored At Behest Of The Bishops,' he quotes the Irish Times's comment that 'The right to offend must be defended with courage and vigour', before saying that it would have been more 'uplifting' if the Irish Times editorial had expressed regret for how it had removed from its archives a Martin Turner cartoon because, he said, it had offended senior members of the Irish Catholic hierarchy. Now. Moloney's a smart man, and on the face of it you might think he's making a fair point. It's worth taking a look at the cartoon, though, which we can easily do because, well, it's not 1904, and things tend to end up online about two minutes after newspapers remove them. (For instance, do you remember in October 2004 when the Guardian removed from its archives a Charlie Brooker 'Screen Burn' column that ended by lamenting the probability of George W. Bush being reelected president, and said 'John Wilkes Booth, Lee Harvey Oswald, John Hinckley Jr -- where are you now that we need you?' No? So, anyway, here's the Turner cartoon, the removal of which so irks Mr Moloney, because, of course, an Irish publication freely deciding to withdraw a cartoon while retaining the services of its cartoonist is comparable to a load of cartoonists and other magazine staff being butchered. It is, we should start by conceding, not a very good cartoon. It's a leaden thing, where three priests, all rather surprisingly wearing what I presume are meant to be cassocks*, and one stepping out of a confessional box rather perplexingly wearing an alb as well as his stole, sing 'I would do anything for children (but I won't do that)'. Presumably this is to the tune of Meatloaf's seminal return hit, 'I would do anything for love (but I won't do that)'**, though if you can get the priests' line to scan to the original tune you're a better man than I am. 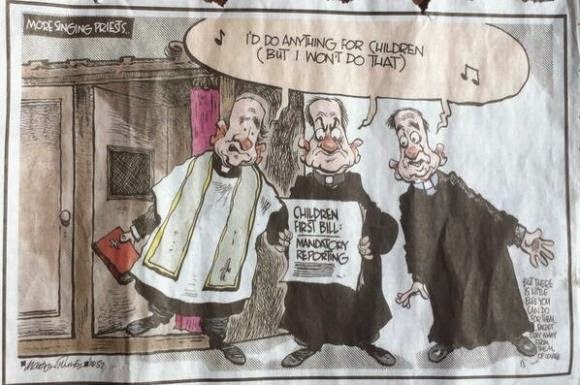 In case you're too thick to realise that this was intended as a comment on Catholic opposition to one element in the child protection laws being introduced at the time, one of the priests -- presumably singing with his mouth closed -- is scowling down at a newspaper running the headline 'Children First Bill: Mandatory Reporting'. As an English friend pointed out the other day in a more general context, if you feel the need to include newspaper headlines to spell out what your cartoon is about, you've probably not done a very good cartoon. And, of course, if you don't see the significance of Catholics taking issue with a particular proposal that might limit freedom of religion in return for nothing that would actually protect children, and if you're not willing to concede that the Church in Ireland has -- so, so, belatedly -- been pretty much the leader in Irish child protection over the last decade or so, and if you don't have a problem with government ministers crowing about this proposal while actual experts in child protection point out that the planned legislation wouldn't help anyone and was being conducted in tandem with policies that would endanger children, well, then you're probably not very bright, not very well informed, or just not really interested in protecting children at all. The day after the cartoon appeared, there were two letters in the paper, both from priests, one describing the cartoon as 'bigoted, nasty and downright disgraceful', pointing out that given the Church has more stringent child protection guidelines than any other body in Ireland, it was a cheap shot and a betrayal of anti-Catholic bigotry to 'use the sins of the past as a stick to continue to beat the church of the present', while the other describe it as 'offensive in the extreme to every priest in the country', and required an editorial apology unless the paper was of the view that it was 'open season on priests'. The following day there were four letters about the cartoon, one of which said the cartoon was below the belt, but that as a satirical cartoonist it was Turner's job to be offensive. The other three were less understanding. One described the cartoon as 'a new low in Irish journalism', reminiscent of the sectarian cartoons of the nineteenth-century American Thomas Nast. Another, from a long-time fan of Turner, said the cartoon was 'bigoted', 'nasty', and 'spectacularly unfunny', revealing a potent double standard where the paper's general 'zeal for anti-religious comment' was not being 'applied to critical analysis of current government scandals'. A third, from a reader of the 55 years, described the cartoon's publication as 'an error of judgement' that warranted an apology to Ireland's priests and the paper's readers. No, really. No laughing at the back there. The Turner thing was very simple. The Irish Times has its own guidelines, Turner breached them by irresponsibly and ignorantly casting all priests as dangers to children -- and if you think this is a fair comment on the phenomenon of abuse in Ireland, you really should read more -- and so the paper pulled it. To make out that this has broader implications would be as outrageous as me saying that because my school magazine was once pulled from distribution because of a story I had done in it, so nobody at that school should ever be allowed to take issue with cartoonists being murdered. Blas for me! Blas for you! Blas for everybody in the room! Then there's the blasphemy law thing. It's probably worth starting with the fact that I don't much care either way about the blasphemy law, such as it is: it doesn't bother me, and it wouldn't bother me if it were removed. I don't know any Catholics who are fans of it, to be honest. Some are opposed to it, and many wouldn't even bother shrugging if it were removed. Now, the standard line about the blasphemy law over the last few years that it should be removed because it encourages Muslim countries to introduce similar blasphemy laws has been tweaked in the last week to the effect that 'Because of Ireland's blasphemy law, Charlie Hebdo wouldn't even be allowed in Ireland!' As such, so fools argue, we should remove the blasphemy law as a mark of respect and as a way of championing real free speech. It's worth bearing in mind where the blasphemy law came from. A constitutional quirk basically requires the state to have some kind of blasphemy law, but Ireland's politicians sat on this legal oddity for ages, without people jumping up and down and claiming that they had to give legislative force to a constitutional imperative. Eventually, though, when tidying up issues of libel and slander and such in 2009's Defamation Act, the issue of other limitations on speech came up. The result was the so-called 'blasphemy law', better known to those who read as section 36 of the Defamation Act. Section 36 says that those who publish or utter blasphemous matter can be subject to a fine of up to €25,000. Matter should be deemed blasphemous, if says, if a) it is "grossly abusive or insulting in relation to matters held sacred by any religion, thereby causing outrage among a substantial number of the adherents of that religion" AND b) if the causing of such outrage is intended. That bit about intent is crucial, and not just because it is half the definition of blasphemy, such that in Irish law you cannot blaspheme unless you have deliberately caused large-scale outrage. The law goes on to say that it is a defence to allegations of blasphemy for a reasonable person to find 'genuine literary, artistic, political, scientific, or academic value in the matter to which the offence relates'. In other words, the law has a three-part test: has the matter under investigation caused outrage among a significant number of people of a particular religious line, was it intended to cause such outrage, and is it bereft of literary, artistic, scientific, academic, or political merit? To all intents and purposes it's a deliberately toothless law, designed to tidy up a constitutional glitch in such a way that nobody is ever troubled by it, and surely pretty much unnecessary given how the actual crime here seems to be substantively covered by 1989's Incitement to Hatred law. You might take issue with its symbolism, or feel it's anachronistic, but one thing you can't really do is say that it does any actual harm. Our laws are often merely aspirational; this isn't even that. Michael Nugent and his friends in Atheist Ireland disagree, of course, and regard it as a great betrayal that the government doesn't see its removal from the statute books asap as a massive priority. But then, of course, Atheist Ireland has never really understood the law. When the law was first instituted, they ran a list of 25 supposedly blasphemous quotations, daring the State to prosecute them. Of course, leaving aside now many of the quotations could be said to have had literary, artistic, political, scientific, or academic value, and that their publication in 2009 did not provoke large-scale outrage -- nobody cared -- the simple fact of the list having been published to make a political point about free speech meant it was clearly safe from prosecution. Could Charlie be published in Ireland? Well, put it this way: was it intended to provoke anger among Muslims or Catholics or whoever or was it intended to make people think? To take a non-religious example***, is the accompanying cartoon a homophobic or racist piece designed to anger gay people or black people, or is its aim to get people to think about the socio-economic realities surrogacy can entail, with poor women, often from developing countries, being paid to serve as vessels for others' children? No, I think, Charlie certainly could be published in Ireland. Whether shops would want to stock it, or people would want to buy it... that's a different matter. There's no getting away from the fact that the intentional provocation of large scale outrage is a central element in Ireland's blasphemy law; it's a law less about offending God, as in other blasphemy laws, as about deliberately angering people. This matters if we want to think about the trope that Muslim countries, especially Pakistan, like using Ireland's blasphemy law to justify their own similar laws. Do they really do this? So, yes, clearly based in part on the Irish one. And yet also spectacularly different from the toothless Irish law, because it utterly omits the role of intent in Ireland's law, that crucial point which means that you cannot blaspheme accidentally or inadvertently, that blasphemy must not merely be offensive, but must deliberately cause large-scale outrage, and that even should large-scale outrage deliberately be caused, there are a range of legitimate defences, including 'I intended to provoke large-scale outrage, but I was engaged in scholarly research and was telling the truth', and 'I intended to provoke large-scale outrage, but I did so in an aesthetically pleasing way', and 'I intended to provoke large-scale outrage, but I was making a point about free speech'. No it doesn't, you buffoons. Please learn to read. It is disappointing that oafs and otherwise smart people like Ed Moloney have tried to draw links between a responsible editorial decision and brutal acts of murder, just as it is disappointing that others claim Pakistan uses Ireland's blasphemy law to push for blasphemy laws elsewhere and present part of Ireland's legal definition of blasphemy as though it's the whole definition. But that's the thing about free speech: it allows people to say stupid things. Now if you'll excuse me, I have some work to do. * It looks rather as though they're wearing mysterious black night-shirts over lighter-coloured shirts with clerical collars. It's almost as though Turner has never seen a cassock and doesn't actually know what one looks like. Whether such basic ignorance might somehow undermine his point I leave to you to decide. ** Yeah, I know that's not the actual video. Watch it anyway, though. It may prove an education. *** Because I don't see much virtue in republishing things I know many people would be upset by for the sake of making a broader, if somewhat self-aggrandising, point about the importance of free speech. That strikes me as doing something bad in the hope of achieving something good, and, well, there are forbidden weapons. I flit between Ireland and England, skulking round churches, libraries, and museums, wetting my throat rather less often than I’d like, but perhaps more often than I should. I suspect that the secret of life lies in laughter and humility, that only living things can go against the stream, that the riddles of God are more satisfying than the solutions of man, and that placed as sentinels of an unknown watch, we have a duty to whistle. I think even more than I talk, and on good days I do so in that order.